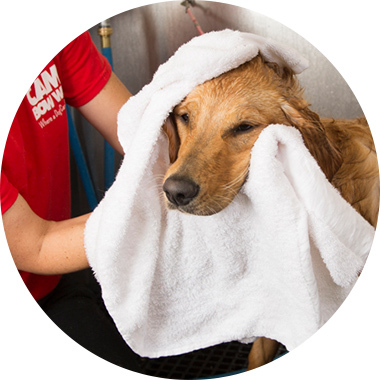 Contact us at (732) 560-3647 to learn more about our dog grooming services. Less than 25 lbs. Includes entire body trimmed or shaved, bath, brush, nails, teeth & ears. Cuts are subject to additional charges if dogs coat is matted. 26-55 lbs. Includes entire body trimmed or shaved, bath, brush, nails, teeth & ears. Cuts are subject to additional charges if dogs coat is matted. 56-75 lbs. Includes entire body trimmed or shaved, bath, brush, nails, teeth & ears. Cuts are subject to additional charges if dogs coat is matted. 76-95 lbs. Includes entire body trimmed or shaved, bath, brush, nails, teeth & ears. Cuts are subject to additional charges if dogs coat is matted. 96 lbs or more. Includes entire body trimmed or shaved, bath, brush, nails, teeth & ears. Cuts are subject to additional charges if dogs coat is matted. Less than 25 lbs. Includes trim or shave face, feet, sanitary, bath, brush, nails, teeth & ears. Cuts are subject to additional charges if dogs coat is matted. 96 lbs or more. Includes trim or shave face, feet, sanitary, bath, brush, nails, teeth & ears. Cuts are subject to additional charges if dogs coat is matted. 76-95 lbs. Includes trim or shave face, feet, sanitary, bath, brush, nails, teeth & ears. Cuts are subject to additional charges if dogs coat is matted. 56-75 lbs. Includes trim or shave face, feet, sanitary, bath, brush, nails, teeth & ears. Cuts are subject to additional charges if dogs coat is matted. 26-55 lbs. Includes trim or shave face, feet, sanitary, bath, brush, nails, teeth & ears. Cuts are subject to additional charges if dogs coat is matted.